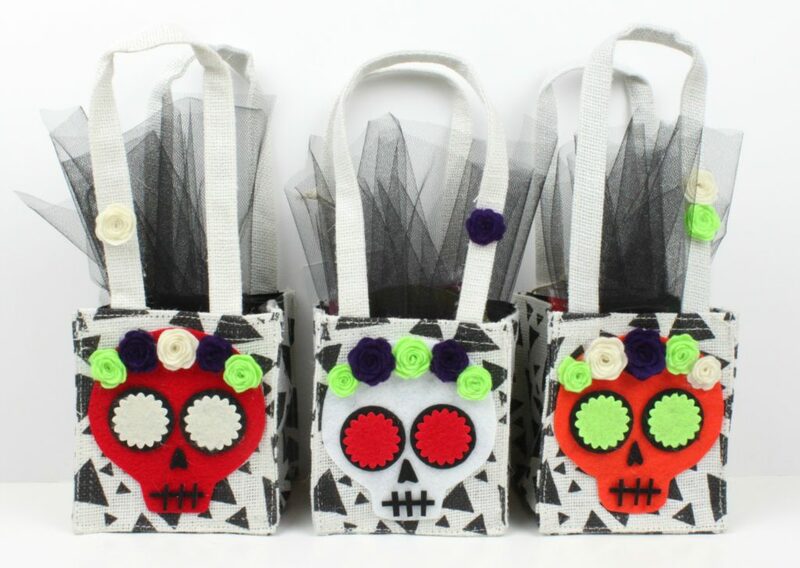 Create sugar skull bags to delight and surprise your friends with this Halloween! This is a sponsored post with Global Purpose but all ideas and opinions are my own. I love random acts of kindness. The world can feel like a scary place sometimes, but by being points of light in the darkness we can make things better. It’s easy to think “there’s nothing I can do!”, but you might be surprised at how impactful one small action can be. That’s what this project is about! Halloween is the perfect excuse to treat someone with a random gift to show friendship and kindness. 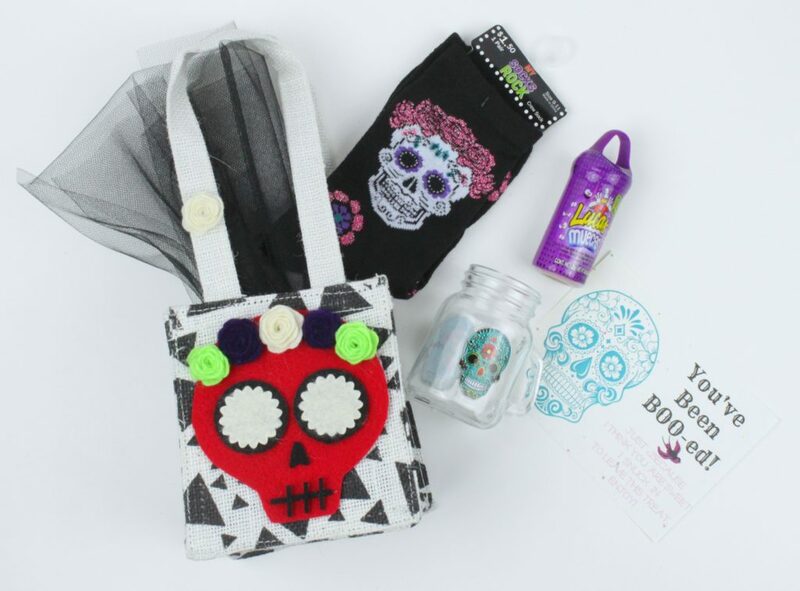 In this twist on the “you’ve been boo-ed” bag, I’ll show you how to create a Mexican inspired gift featuring sugar skulls! 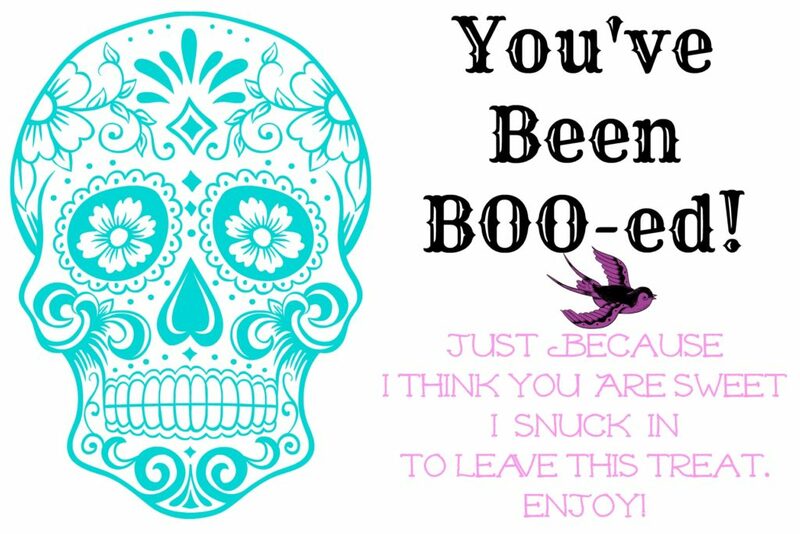 I’m even including a free printable for you to enclose with your surprise bag. All you have to do is wait for the perfect opportunity to leave this surprise treat on someone’s office desk or door step! The perfect base for this act of kindness bag is the Global Purpose Bag. Every purchase of these bags helps provide fair wages and training for 50 teachers at 4 schools across Haiti, and 16 teachers in rural Uganda. And through those teachers, the future of over 2,000 students each school year are directly affected! The purchase of these giving bag supports teachers in a way that supports the entire community. 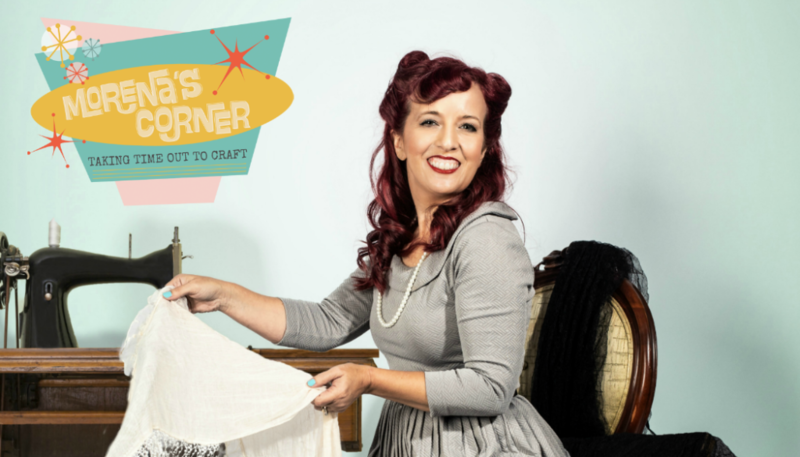 I love that with this one project you can spread hope and kindness both locally and globally! 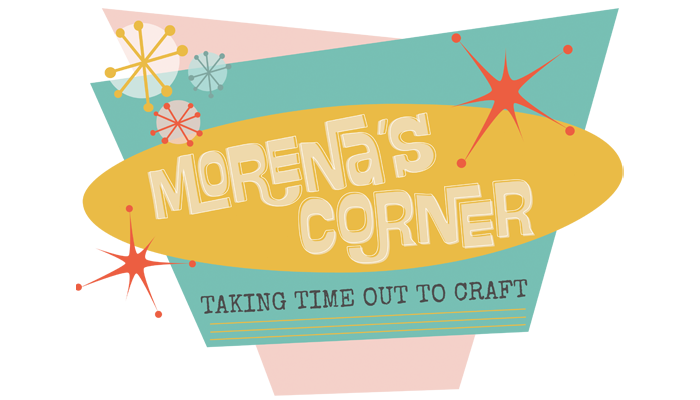 I created a short video tutorial, but here is the text and pictures if you prefer! Step one: Trace the skull template on felt fabric and cut it out. Step two: Cut felt circles to make the eyes of the skull. Cut felt flowers to set inside the eyes. Step three: Cut thin lines of black felt. Cut the lines into shorter segments to make the mouth of the skull. Step four: Cut 3d felt flowers out. 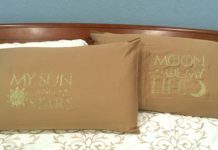 If you have dies and a die cutting machine, use those. 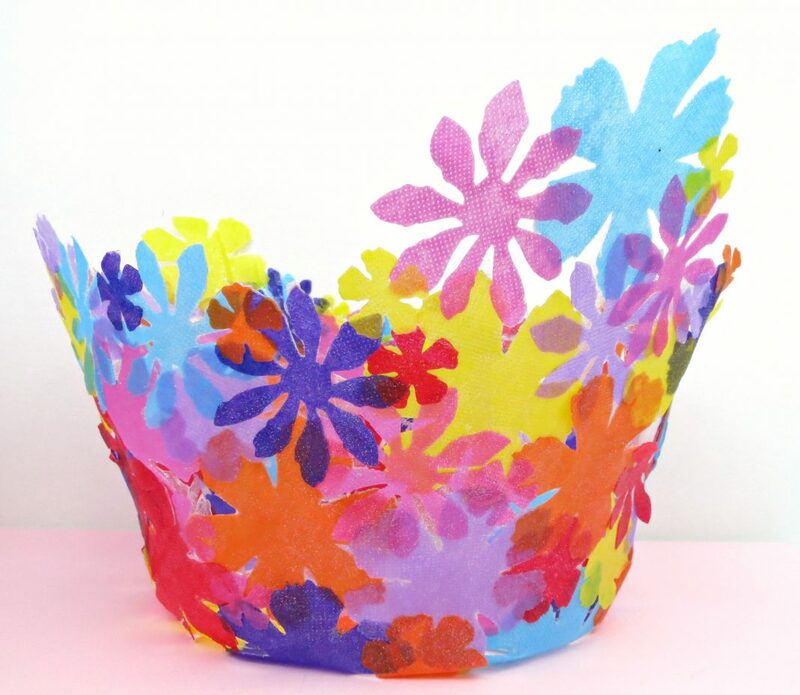 If you don’t have a die cutting machine, here’s a simple way to make felt flowers! Cut a circle out of felt (about two inches wide). Then cut into the circle winding around as pictured to create a spiral. Assemble the flower by starting at the outermost point. Roll the flower (use a toothpick if needed) and hot glue the last piece to the bottom to hold it all together. Step five: Use hot glue to assemble the calavera/sugar skull on the box. Step six: Print out my free message card, and add it to the bag with various goodies. 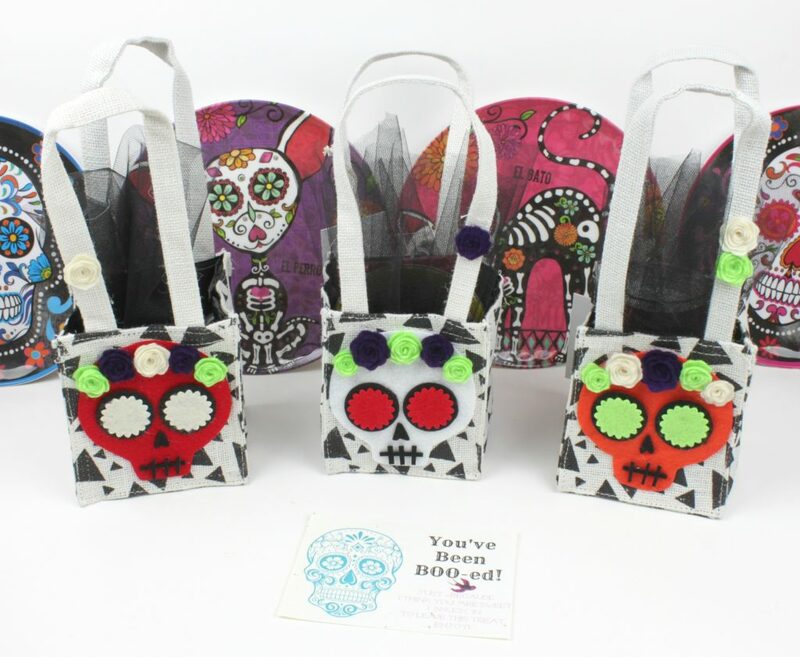 I filled the sugar skull bags with different Dia de los Muertos themed goodies from my local HEB store. 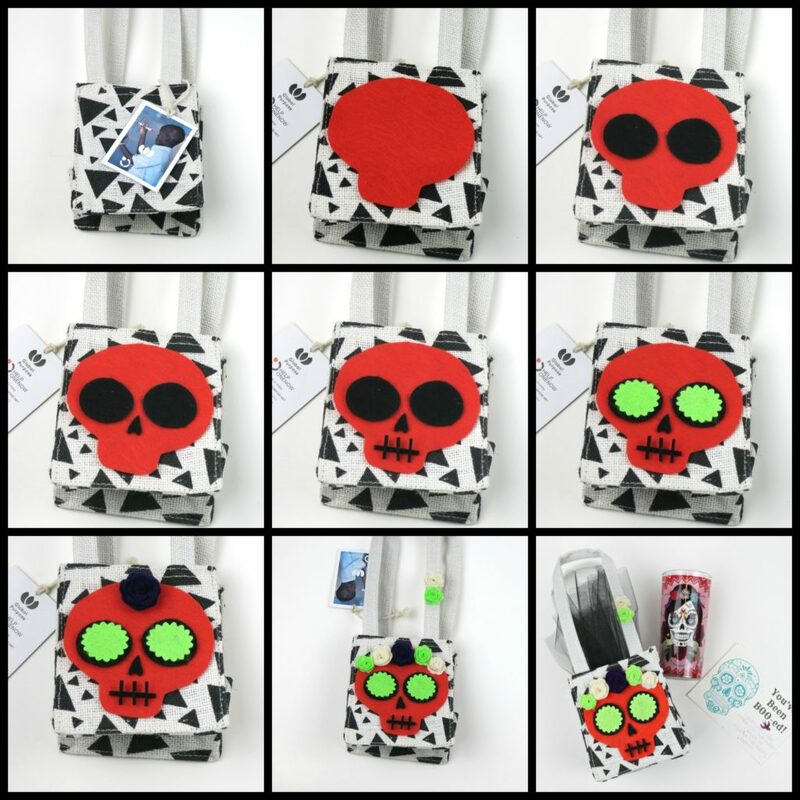 One bag has a cookie and cookie cutter, all shaped like skulls. 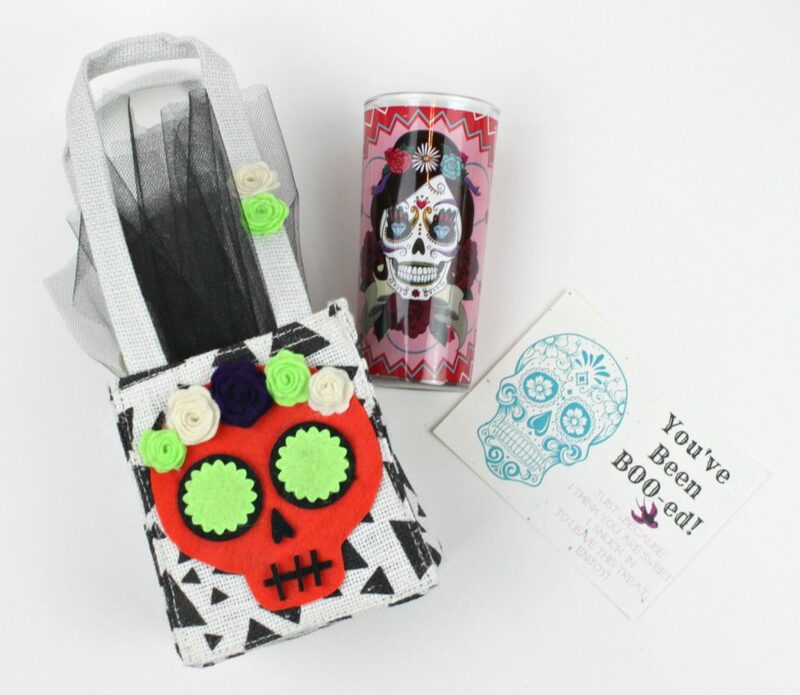 Another bag has a fun calavera themed candle, another has socks, and another has an adorable mason jar shot glass. 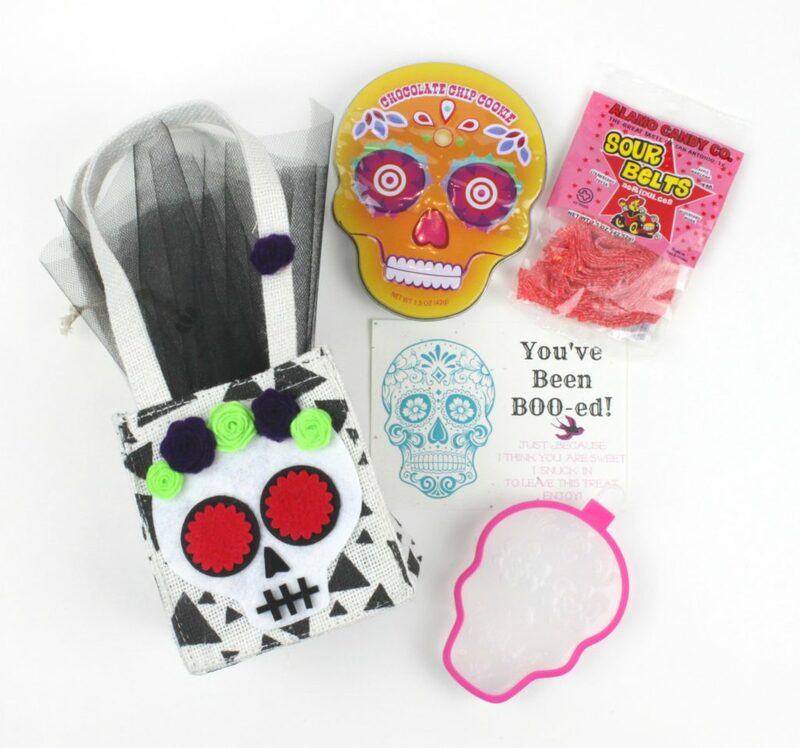 Each of the bags has fun and unexpected Mexican candy, too! 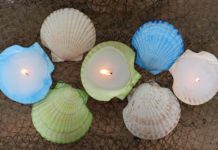 To learn more about Global Purpose, which was created to connect purchases and positive change in real sustainable ways, please check them out on Facebook, Twitter, and Instagram. Global Purpose’s brand partners like “Help One Now” are currently sold in San Antonio HEBs. 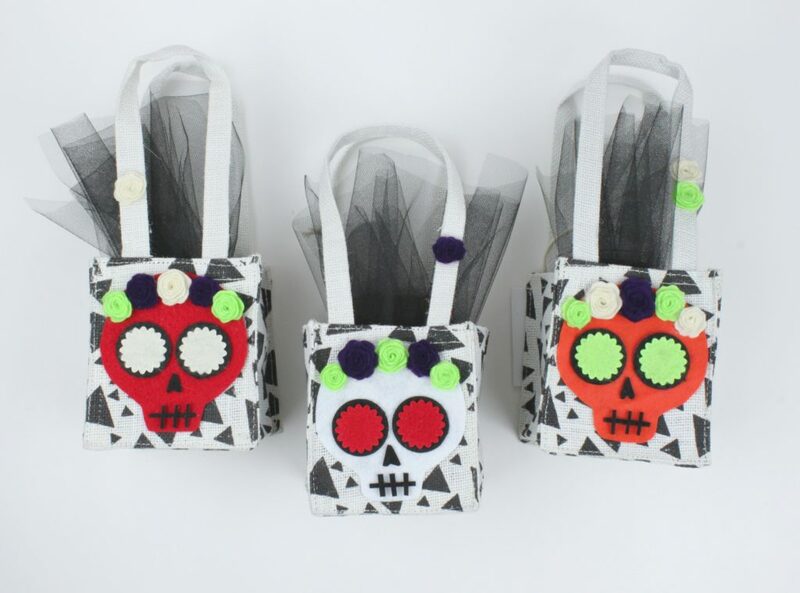 Love how hip and fun these sugar skull bags are! I love the mission and I love your cute bags. So fun.